Fall is the best season for cooking! I can’t peel myself away from my kitchen table where I am surrounded by glossy cookbooks and enticing food blogs with images of farm fresh ingredients… pumpkins, kabocha, figs, dates, Feta, gorgonzola, cranberries, pomegranates, kale, Swiss chard, fennel, Spanish almonds, walnuts …I’m so excited to begin crafting my thanksgiving table. 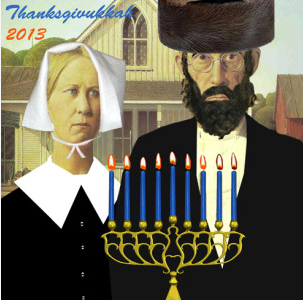 However, this year the holiday has gone wild….the first day of Hanukkah falls on Thanksgiving… renaming it THANSGIVUKKAH! This has not happened since 1888. For me, this holiday hybrid really changes up my holiday game plan and send my hormones raging to new levels! The biggest decision weighing so heavily on my dinner table now is when should I serve the latkes… as an appetizer or with the turkey? And how do I prepare them…traditionally or put a thanksgiving spin on them… way too many options! As I began researching recipes (and eat some protein to calm myself) I find out that there is a powerful connection between these two holidays– both are about a plight for religious freedom … the Pilgrims sojourn to the “New World” in search of their religious freedom and the Maccabees fight for their religious freedom against their ancient greek oppressors. 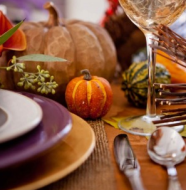 Keep Posted….Thanksgivukkah menu will follow! What hybrid recipes do you plan to prepare?